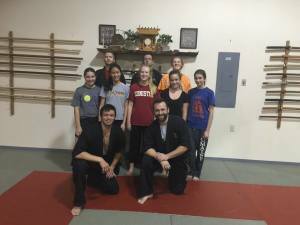 Discovery Martial Arts (Hakken Budo Ninjitsu) is an international martial arts organization that aims to promote self improvement by training students in effective self defense methods rooted in the art of ninjitsu. 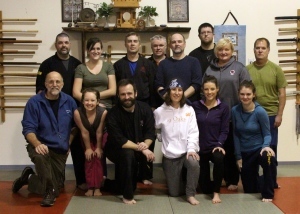 We offer may different class types to work with people of all ages and backgrounds, including self defense, fitness and yoga, and martial arts workshops and seminars. We look to serve the Greater Portland community and beyond. Our school boasts an impressive staff, and we pride ourselves in the personal approach our staff takes in helping students make martial arts work for them. At Discovery, students can expect effective, realistic self defense training, tailored coaching, and an enthusiastic and supportive community. Whether your goal is to learn self defense strategies, get fit, or simply have fun with great people, our school is the place to be. To learn more about specific classes that we have to offer, check out our classes page, and learn how you can sign up for a free trial today! If you are a parent interested in martial arts lessons for your young child, click below to find out about our free trial memberships! We do provide martial arts and self defense workshops and seminars for groups and organizations. We will provide free consultation to help you build an engaging, informative, and effective martial arts workshop for your group! If you are interested in creating a special event for your youth group, click HERE. For an adult or corporate event, click HERE. Senior Girl Scout Troop 106. Effective self defense for teens! 19 Oaks Marketing. An engaging corporate event!